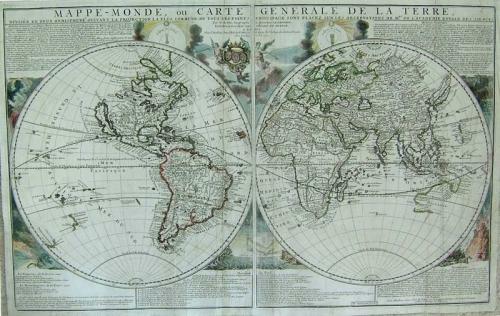 Title: 'Mappe-Monde, ou Carte Generale de la Terre, Divisee en Deux Hemispheres Suivant la Projection la Plus Commune ou Tous les Points Principaux sont Placez sur les Observations de Mrs. de l'Academie Royale des Siences'. Copper-engraved double-hemisphere map, hand-colored in outline, with colored pictorial represtations as background, engraved text at top and bottom. Rare first state of De Fer's 1700 world map, engraved by H. van Loon, with California depicted as an island. Shirley remarks, "In the text surrounding this two-sheet map De Fer states that it is a reduction of a larger one prepared a few years earlier and claims (as others before him) that it is the first to be based on the celestial observations of the Royal Academy of Sciences. The geographical details on the map are in fact less exact than those delineated on the De Fer/Van Loon four-sheet world map of 1694, the earlier map referred to. For certain areas, such as California, Australia and Japan it would seem that a different source has been preferred. The map, nevertheless, contains much of interest and marks considerably more place names than the 1694 forerunner. There is a textual commentary, a table of no less than thirty different measures of the length of one foot according to the definitions or customs of towns in Europe, and corner vignettes of thunder and lightning, tempests and tides, and volcanic eruptions. Two circular diagrams at the top illustrated eclipses of the sun and moon." Ref: Shirley 600; plate 414. Several sizable tears professionally repaired with paper to the verso (no loss), good to very good.